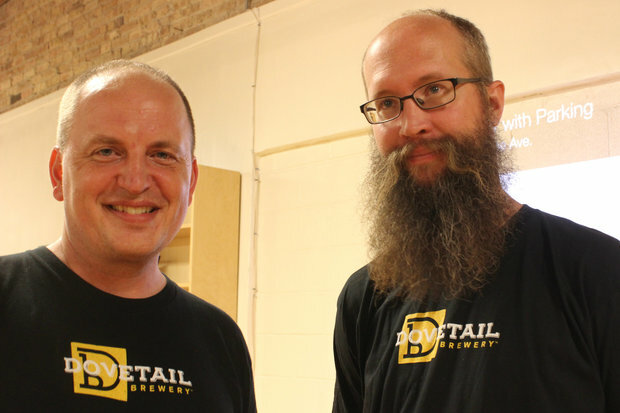 Hagen Dost and Bill Wesselink are co-owners of Dovetail Brewery, projected to open in Ravenswood in spring 2016. RAVENSWOOD — The craft beer movement shows no signs of slowing down, with Dovetail Brewery announcing plans to open a production facility and taproom in Ravenswood in 2016. Owners Hagen Dost and Bill Wesselink introduced themselves to members of the community Thursday night, presenting their concept for a brewhouse at 1800 W. Belle Plaine Ave. The building was formerly occupied by Atlas Material Testing Solutions, which decamped to Mount Prospect. "We will be good neighbors," Dost pledged to the handful of residents in attendance. "And I think it goes without saying we want to see you in the taproom." Dovetail will join a slew of brewers in the Ravenswood corridor, including Begyle, Spiteful and Empirical. Wesselink, who met Dost in 2011 at beer school in Munich, said that hardly means the market is saturated. "We've got 10 million people and 60 breweries" in the Chicago area, he said. "There seems like a lot of room for growth." The brewers intend to separate themselves from the pack by focusing on continental European-style beers. Dovetail's flagship offerings will be a hefeweizen (German-style wheat beer), a lager and a Belgian-style lambic, which takes two to three years to ferment, Wesselink said. Making wine at home is common in Croatia, a tradition Dost endeavored to keep alive until he grew frustrated with the quality of grapes he was able to obtain. "I got into Belgian lambic and I thought, 'Oh, I could make beer,'" he said. "I got deeper and deeper into it ... and then I met Bill." The two bonded over an appreciation for similar styles of beer and Old World brewing techniques, which explains the origin of Dovetail's name. In woodworking, dovetail refers to an incredibly strong joint created without the use of nails or glue. The term appealed to Dost and Wesselink in the sense that they're "two master brewers coming together" and it also references their coupling of Old World brewing methods with New World technology and creativity, Wesselink said. The brewery's construction timeline is still up in the air while Dost and Wesselink wait on permits and licenses. "Call it spring," Wesselink said of a prospective target. Once up and running, Dovetail will produce roughly 1,700 barrels of beer a year in the two-story facility, he said. For comparison, Lagunitas' Chicago brewery has the capacity to produce up to 1.2 million barrels. Approximately 25 percent of Dovetail's production will be devoted to the taproom, including some beers available only on site, with the remainder initially distributed within a two-mile radius, Wesselink projected. Much of the duo's presentation centered on reassuring neighbors that the brewery wouldn't be a noisy, smelly nuisance. "We're two guys with families and we live in quiet neighborhoods too, so we understand," said Dost, who makes his home in Ravenswood Manor. Wesselink lives in Northbrook. The brewing process doesn't create any noise, though trucks making deliveries could, he said. For that reason, Dovetail has specified no deliveries before 8 a.m.
Brewing aromas are similar to those produced by bakeries (all that yeast) but Dost acknowledged not everyone finds the odors pleasant. Dovetail's design incorporates chimneys to vent smells above the building's roofline. The taproom, with a capacity of just under 100 people, will close at 10 p.m. at the latest, on Fridays and Saturdays, and there will be no live music or sidewalk cafe with boisterous patrons, Dost said. Ross Outten, owner of Dolce Casa cafe and president of the Ravenswood Community Council, welcomed Dovetail to the neighborhood. "I'm excited to see this," he said. "We're 100 percent supportive of these guys." More importantly, Outten added, "I've tasted their beer and it's delicious."